A child born in a Glasgow, Scotland suburb can expect a life 28 years shorter than another living only 13 kilometres away. A girl in Lesotho is likely to live 42 years less than another in Japan. In Sweden, the risk of a woman dying during pregnancy and childbirth is 1 in 17 400; in Afghanistan, the odds are 1 in 8. Biology does not explain any of this. Instead, the differences between – and within – countries result from the social environment where people are born, live, grow, work and age. This is a quote from the recent report from the WHO’s Commission on Social Determinants of Health. It is a fascinating document of worldwide health inequalites, and vividly details how such unfair differences can occur within countries and even within small populations. 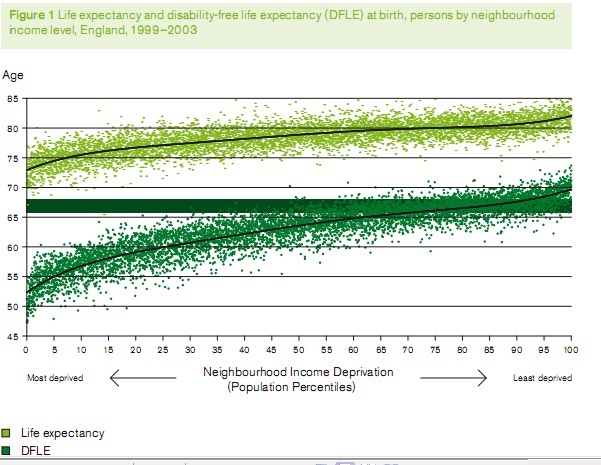 This issue is what I was discussing on my recent post on health inequalities in Beijing. Those of you interested in learning more about this topic should definitely read the above report, as well as some outstanding resources from other public health groups which can help you learn more about the concepts of health inequality and a social gradient of health. It is dramatic data like this which drives the WHO and other policy makers to encourage much more intervention of improving not only access to healthcare but improving neighborhoods, job satisfaction, and inequalities of poverty. For me, now that I know all this, I may be much more thorough asking about history and social issues in physical exams. For example, if I screen a 40-year old man who has great labs but then tells me he was born “a premie”, then I may be advising him more about diabetes risks and how he can help, and I may check his sugar levels more often. Previous PostPhysical Exams 1, Genetic Tests 0Next PostCan The World Cup Affect Your Health? Low birth weight babies are much more at risk of being fed formula. I don't know if there are any papers about adding "just a little" formula. But formula feeding (as opposed to breastfeeding exclusively) has also been definitively linked to diabetes. About "just a little" formula, I once read that the criteria for being considered in the "breastfed baby" category for a study, a baby can receive, at maximum, ONE eight- ounce bottle per every two weeks. It seems that the formula even occasionally ingested affects the gut flora so negatively, and the overall health, that they have strict definitions of the amount of formula a baby can have, and still be considered "breastfed". Just a thought about the birth weight and diabetes chart. Very interesting. And congratulations! I'd be willing to take a survey, and spread the word. healthcare disparities among ex-pats in Beijing. purchased a product that cleared the infection. to get a representative sample of ex-pats in Beijing…"